The Huawei is one of world’s Top Smartphone manufacturer has many great phones under Honor sub-branding and Huawei Honor 7 is one of its most popular, specs rich mid range phone that is loaded with the 5.2 inches IPS-NEO LCD, Android v6.0 (Marshmallow), 20 and 8 MP camera, Kirin 2.2 GHz processor, 16/64 GB ROM, 128 GB SD card support and 3100 mAh battery. 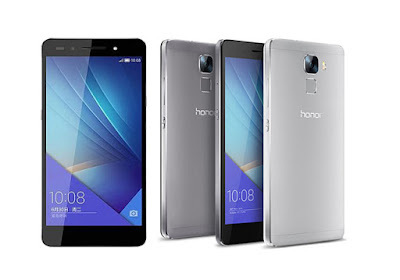 Here we will have Short review, Pros and Cons of Huawei Honor 7. The metal uni-body is quite pleasantly carved that makes design more attractive but loses its capability to remove the back cover or battery. The power and volume keys are on the right; left edge has SIM and microSD tray and the 'Smart' key. While the USB port and speakers are at the bottom. On the top it has 3.5mm socket and an IR blaster. There we can see a lil innovation where they have added Smart Key which works in 3 level i.e. single press, double press, and a long press. We can customise any kind of task or application for these three levels of pressing. Phone has 5.2 inches display which is a regulated size between Smartphone and Phablet. Display featuring 1080p pixels resolutions and 424ppi of display density, which is pretty sharp and emits vibrant colours. The movie watching experience is amazing because of crisp display and distortion free loud speaker. To make is resistible to the scratches it has Corning Gorilla Glass 3 protection. Huawei is one of the company which is making Chipset their own for devices and Honor 7 includes companies most advance HiSilicon Kirin 935 octa-core processor with 2.2 GHz clock speed. We found that this processor doesn’t heat as other counterpart chipsets and running quite smooth even in multitasking. Although Mali-T628 MP4 GPU disappointing, which is older and sometimes struggling in delivering the frames in heavy games. Although it doesn’t have any major issue regarding this. The handset offering 20 MP primary camera, high resolution of the camera helps in gathering more details about the subject even after zooming. Honor 7 has pretty well shooting camera, photos comes out sharp and colour reproduction is great. Although we can’t recommend this for low light photographs where pictures looking blurred. 8 MP camera capable of taking decent selfies which is not going to disappoint selfie lover. Huawei Honor 7 has 3100 mAh battery giving Normal battery back of one full day. That is neither impressive nor disappointing. But you may miss quick charge 3.0 feature in this handset. Sharp shooter 20 MP camera. The Huawei is one of leading player in smartphone world and the Honor 7 is one of leading mid range smartphone from company. Considering its price this phone has best features and quality which includes metallic uni-body, smooth processor, quick and accurately working fingerprint sensor, good 20 MP primary camera and a decent battery. This is also good to know that company also announced Marshmallow update for the handset. Although there is another phone Honor 5X in lesser price with great specs.